In the life of a toddler you can pretty much guarantee that 99.9% of the time you aren't doing what they wanted. A request of fish fingers with dippy sauce that you have put in a splodge next to the fish with result in an almighty tantrum. A week later (after learning your lesson!) you will put the sauce in a cute little pot next to the fish. WRONG! Again you will be met with a wild child who wanted it in a splodge next to the fish. You will never get it right, if you are smug and think you got it right, you are so wrong! I repeat, you will never get it right! For instance when we went shopping last week, I picked up some jelly sachets and Bubba spent that evening carrying them around the house. I promised I'd make some jelly, I promptly forgot. So next morning I made jelly whilst getting us ready to leave for nursery and ushering the electrician in to start pulling up carpets (so read: manic). Thinking I was clever, I poured it into some ice cube trays she had been using as skateboards (don't ask, toddlers imaginations are vivid!). Smugly I thought 'she's going to love this'. Wrong. When she saw what I'd done, all hell broke loose and a tantrum in the kitchen ensued. She didn't want it in her skateboards mixed with wanting the non set jelly right away. My pride at doing something good was replaced with disappointment that I'd got it wrong again! 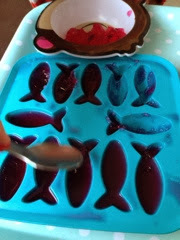 Anyway, we sat eating the jelly that evening and the next day straight from the ice cube trays (purely because I couldn't get it out of the mold without making a huge mess. Mummy fail!